This food find was submitted by Deb G. in Attleboro, Massachusetts. 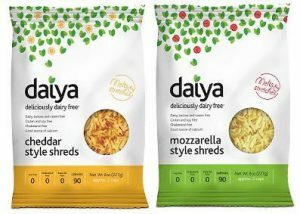 So far, I’ve found I like the Daiya brand best for cooking. I’ve tried both the mozzarella and cheddar cheese. They both melt wonderfully and come closest to the texture and consistency of the real thing once cooked. I’ve yet to find a vegan substitute I like “raw”. Thanks for submitting your food find, Deb!